Happy Monday! 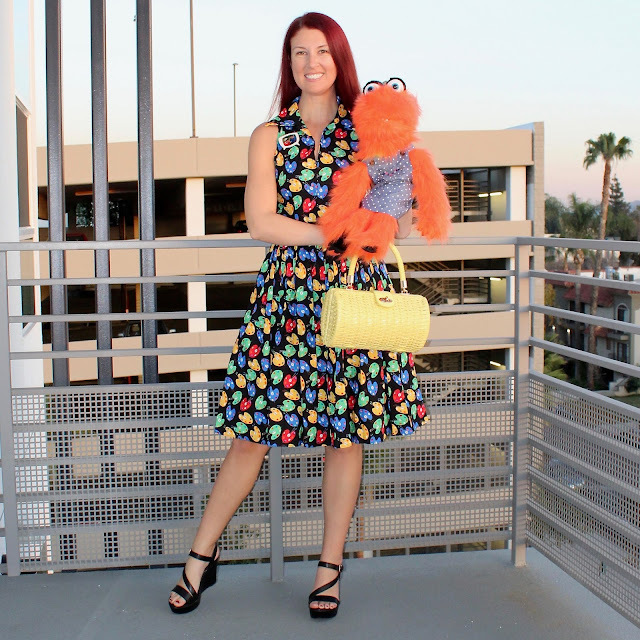 Here's a quick post from an outfit I wore to puppet improv 2+ weeks back (I'm a bit behind in posting!). LA has finally been (somewhat) warmer at night so I've been able to to wear dresses to evening classes. 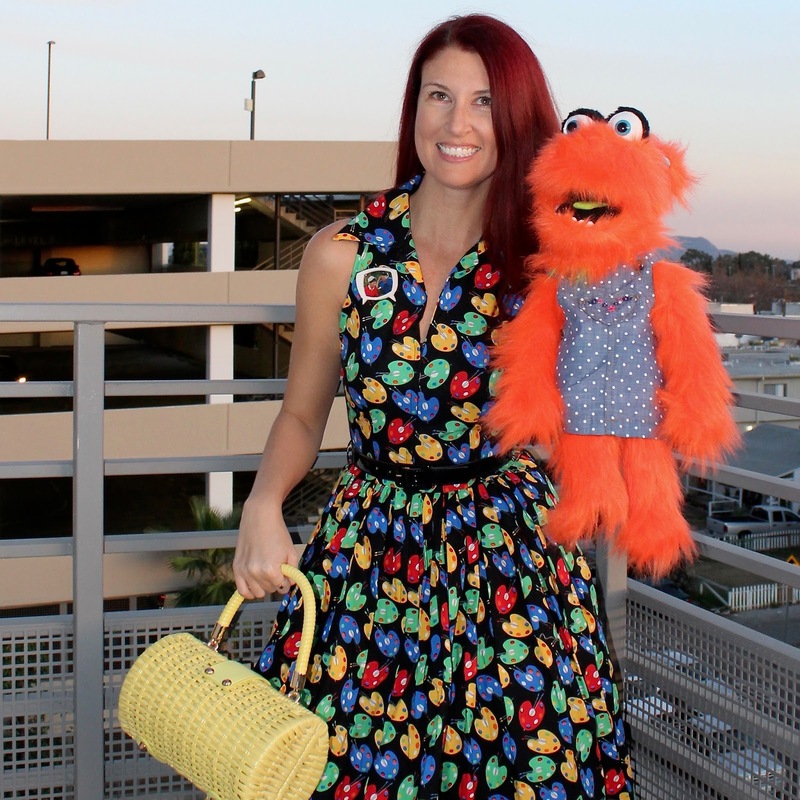 This is my last post featuring ALL outfit photos with Raquel, my puppet. Future pictures from our school outings will feature one photo with her and the rest will be about what I wore. 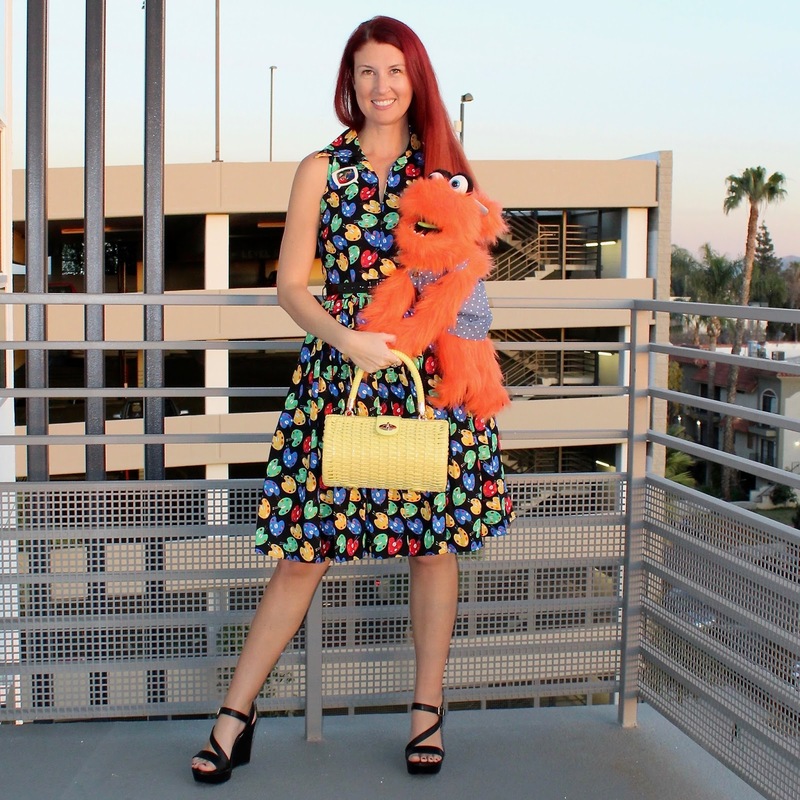 Speaking of, how awesome is this Bernie Dexter dress? The Mari is officially one of my favorite Bernie styles (though if forced to pick I like the seemingly discontinued but similar Lydia style a bit more). The paint palette print dress by Bernie Dexter comes in tons of styles AND colorings, but this one may be my favorite! Pairing this dress with my Atomic Lucite Gilligan's Island brooch was perfect as the whole picture on the brooch is primary colors. I got this Pinup Girl Clothing wicker basket in yellow over Black Friday and I seriously can't say enough great things about it! I thought it would be more novelty than practical but it has a crazy amount of depth! One night I brought it to class and fit keys, cards, a diet coke, snack, and phone in it--with room to spare! This was a delightful surprise, so now I want them in every color! These wedges are a serious go-to of mine from ModCloth, though they have been discontinued. School has been going well this term and I'm officially over the halfway point, which is insane! Some changes and additions are coming for spring and I can't wait to share more details with you. For now, I have my first show at Second City at the end of the month and it's with my puppet Raquel! I've been enjoying my puppeteering class and it's been great being around like minded adults who love all things Jim Henson and who are also serious about puppeteering in comedy. This is Second City's first class in puppeteering, so I feel like I'm at the right place at the right time. Raquel is getting some outfit upgrades over the next week...and a brother! She's also been "cast" in a video that my new comedy partner and I are writing/producing. More on all of that in the near future! Have a lovely Monday!